When I started wearing makeup I would buy the exact same items that my mom had in her makeup collection. Covergirl liquid foundation, Maybelline Blush, Eyeliner, and Mascara. That's all I had and that I knew because I'd been watching my mom do her makeup for many years. Once I started experimenting with other makeup, I would find what worked for me and what I liked using. As a beginner you will always go through trials and tribulations with makeup products. You'll often leave the house looking like a wreck but there will also be those times where you leave the house thinking "Watch Out Tyra Banks, there is a new super model in town!" No? Just Me? On a daily basis I get asked what foundation I use. And the question is often followed by "I don't usually wear foundation because I'm not sure what is good and what color works for me." And so, I give them my list of my 6 Beginner Foundations that I still to this day love and often use on myself. They are affordable too! Yay!! I see this mistake happen on a daily. You need to pick a foundation with a formula that works for your Skin type. Combination: Oil-Free but Water-Based w/medium pigment levels. 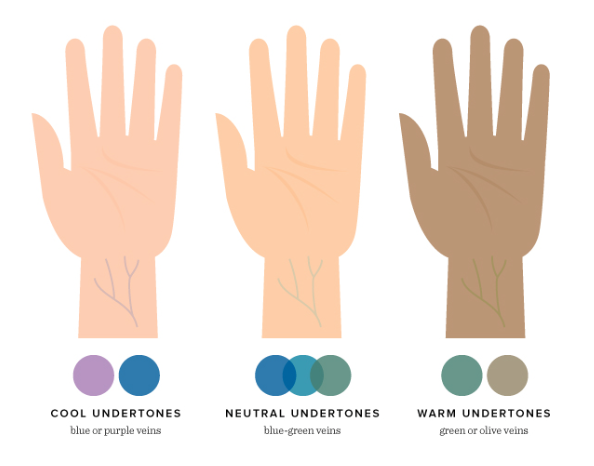 When looking to color match, it's important to know your undertone. Are you cool toned, warm toned, somewhere in between? Go out in the day light and look at your wrist vains. After you've determined you skins undertones: blend a dot of foundation under your jawline towards your chest to determine if the foundation color matches. Application means everything when it comes to flawless foundation. When I try a new foundation I use all the tools I can to see what applies the best. A beauty blender sponge, stippling brush, buffer brush, or my fingers. It's all about finding what works best. Ready, Set, Gorgeous is a great foundation because it's easy to work with and it's an oil-free medium to full coverage which is great for those with acne prone or combination skin. I like to apply this with *clean* fingers starting in the center of my face blending outwards. And to pick up any extra product I may have left behind I like to go over my face with a damp beauty blender pressing my foundation into my skin. Clean Pressed Powder Foundation this powder foundation is going to be great for those with normal-dry skin. If I'm not using this powder all over my face, I'm using just a tad to set my foundation. I love pressed powders because they have a medium-full coverage while still letting your face feel lightweight and natural. This product is also available with a formula for Sensitive Skin and Oil-Control. Loreal True Match this foundation is my ride or die product. I've been using Loreal True Match for many, many years. Loreal has the biggest color selection in the drugstore when it comes to foundations. 33 Shades to choose from, which makes it so much easier to color match. It's perfect for all skin types and it's oil-free which means it won't clog your pores either. If you have dry skin, like I do, and you love a luminous skin; try Loreal True Match Lumi. This color selection is 15 different shades and offers the same thing the regular True Match does, except it adds a glow to your skin. I like applying this foundation with a buffer brush and a damp beauty blender. You can find my 3 favorites HERE, HERE, and HERE. Loreal True Match Powder This is a powder that you will always see in my collection. I use it has a full face foundation powder and I use it as a setting/touch up powder. It's so versatile. I also love using the dark shades for contouring because a foundation powder, such as true match, has a smoother formula that's easy to blend. I'd apply this with a big powder brush like this one from real techniques. Maybelline Fit Me Foundation When I first tried Fit Me, there was only one formula. You can now buy this product with a Dewy + Smooth formula for normal to dry skin. Or Matte + Poreless for Oily-Combination skin. This is one of my favorite drugstore foundations to work with because of how smooth, blendable, and buildable it is. I love to apply this with a Buffer Brush so I can press the product into my skin and then I like to finish it off with a damp beauty blender just making sure to not leave any excess foundation sitting on my skin. Maybelline Dream Matte Mousse My first self-purchased foundation. This is the foundation I used for 4-5 years. It's not for every body. But as a beginner I found it the easiest to work with because I didn't need a bunch of tools to apply it. Clean Fingertips. That's all I used. I dabbed a dot on each cheek, my nose, chin, and forehead - then I blending it outwards while pressing into the skin. It's such a light-weight formula that lets air still get to your skin and it's perfect for normal-oily skin because its medium to full coverage as well as finishes in a powdery-matte affect. 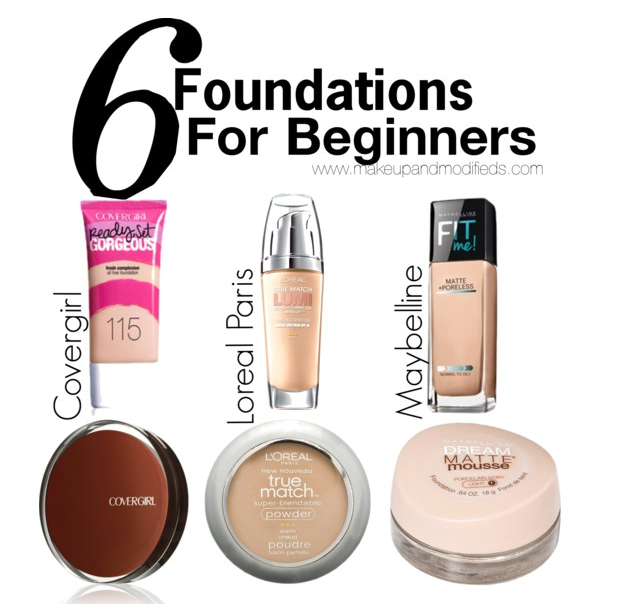 I hope you find the perfect beginner foundation that works for you. Don't be afraid to try different products out and don't be afraid to make mistakes along the way. The Best way to become great at applying flawless makeup is PRACTICE! Take Your Time! You'll get there! Just remember: Be Your Own kind of Beautiful!